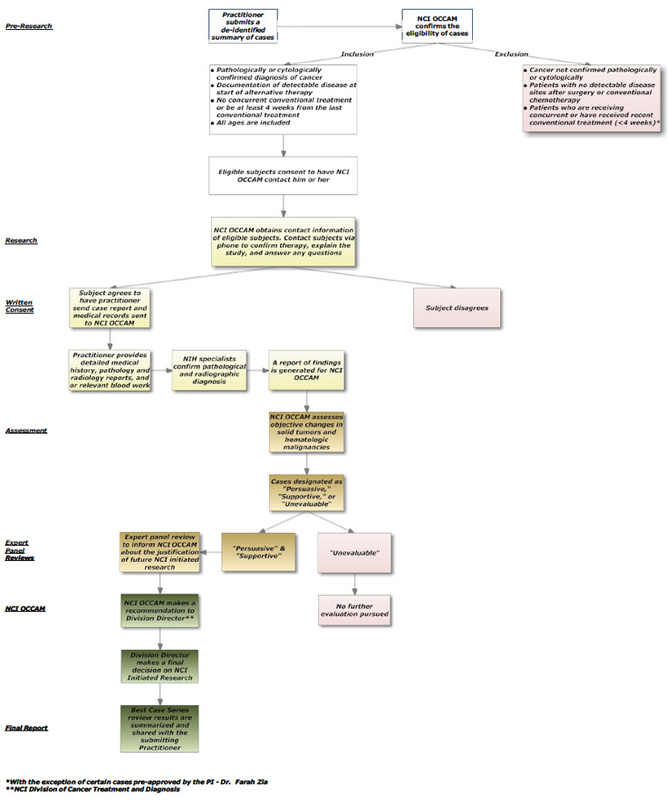 The flowchart below describes the role of the practitioner in the process of submitting case summaries and their respective medical records to the NCI Best Case Series Program. To help elucidate the flowchart the following description provides greater detail about some terms used on the flow chart. In the “Pre-Research” phase (as designated on the left hand side of the flow chart) the practitioner submits a series of 3 to 20 de-identified cases for confirmation of eligibility. In the “Research” phase, NCI OCCAM informs the practitioner to provide a detailed medical report of the eligible cases, after receiving the signed protocol consent. In the subsequent phases, the detailed medical reports of eligible cases are thoroughly examined and classified as “Persuasive”; “Supportive” or “Unevaluable.” Following the complete review process, NCI OCCAM will make a recommendation to the Director of the Division of Cancer Treatment and Diagnosis (DCTD), who will then make the final decision regarding the possibility of NCI-initiated research. Finally, a summary of the NCI BCS review will be sent to the submitting practitioner. View the NCI BCS Protool Flow Chart (pdf) for a visual representation of the process of submitting cases.